Cellphone recycling services are ubiquitous today, but this is the first time I've seen the process automated and presented in a convenient ATM-like package. Updated. 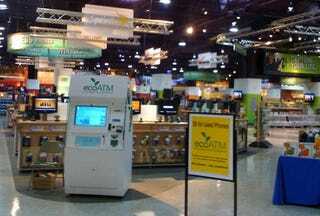 Supposedly, the ecoATM went live on Friday, in an Omaha furniture store, of all places. Update: It's not a store, it's a mart! Nebraska Furniture Mart. And it's huge! The process is pretty simple. The cellphone is placed in the ecoATM, scanners judge how terrible you were to your phone over the years, and then you are presented with a quote that can be used as store credit or cash. Cellphone beat up beyond repair? That's OK too: ecoATM cheerfully informs you that the phone will be recycled and that a tree will be planted in your name.